While the boys and the girls were both a little short of their State goals this season, we know everyone ran their best at State. The effort we saw this year was unprecedented and we know all of our runners, not just our State runners, are going to continue to improve in running if this level of effort continues. Since our Awards Night is meant to celebrate the entire team and not our State runners, we wanted to take the time now to thank our State runners for a fantastic season. Alex Stewart is one of the most successful runners to run for Yorkville Middle School. She quietly goes through her workouts not seeking to garner attention for herself. When she was a runner at Bristol Bay’s elementary program, one of the boys on the team was bragging that he had the fastest time on the team. Alex quietly stood next to the runner as Coach Miller told the runner that Alex actually had the team’s fastest time. In seventh grade, Alex set numerous team records. 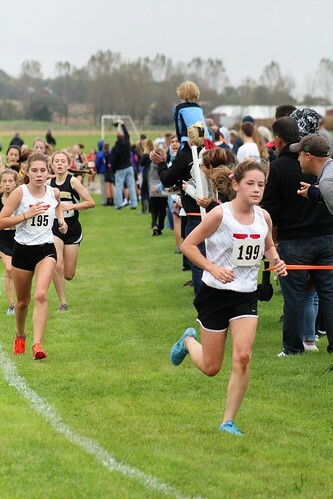 She holds our seventh grade girls course record at Lyon Farm with a time of 12:32, the Tiger Trails record with a time of 12:26, and our seventh grade State record with a time of 11:46. In addition, Alex holds both the seventh and eighth grade records at the Parkside Invite with times of 11:54 and 11:53, respectively. Alex also has the second-fastest P.R. ever for a Yorkville girl at 11:25 and the second-fastest time at State with a time of 11:35. 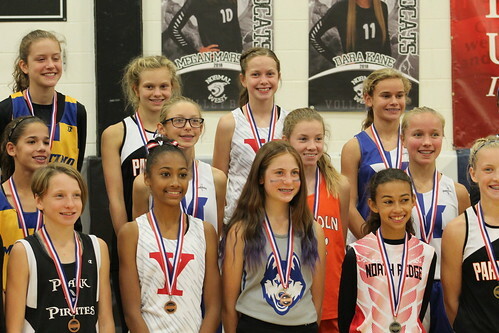 In earning All-State honors for the second time this year, Alex became only the third runner in Yorkville Middle School history, boy or girl, to accomplish this feat. 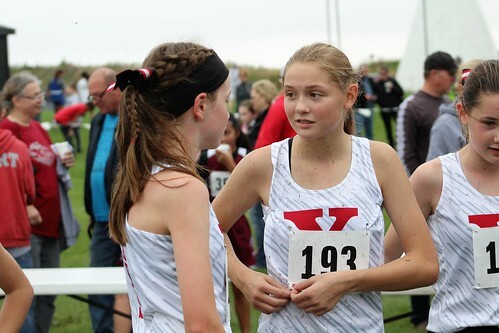 Makenna Edwards followed in the footsteps of her older sister and brother, who both ran for Yorkville Middle School’s program as well as the high school. Makenna established herself as a leader early on. In seventh grade, when the team was in need of strong leadership, Makenna stepped up and became a positive leader on the team. This leadership ultimately led to her becoming only the second seventh grader to earn our Captain of the Year award. Makenna ran well in seventh grade with a P.R. of 13:01 and earned a spot as an alternate on our State team. Makenna set an individual goal at the start of this season to break 13 minutes for two miles. She did this when she ran a 12:53 time trial at our first practice. At this point, Makenna probably realized the potential she had for a great season. Makenna was always an outspoken leader on the team and made sure her teammates were working just as hard as she was. Makenna made great progress as the season went along, setting or matching her P.R. at every invite we had. Makenna saved her best for last at State when she broke 12 minutes for the first time by setting a P.R. of 11:53 and earned All-State honors in 20th place. Makenna ran perfect splits of 5:57 for each mile at State, a feat matched by only one other top 25 runner at State. Katie Melzer had a pretty quiet year in seventh grade. She broke 16 minutes for two miles for the first time at Lyon Farm, broke 15 minutes for the first time at Tiger Trails, and nearly broke 14 minutes with her P.R. of 14:08 at Fox Trot. Katie had a successful track season and made State for the hurdles, but nothing she did in seventh grade could have predicted how well she would do in eighth grade. In eighth grade, Katie established herself as one of the team’s top five runners. She finished as the team’s fifth runner at the Parkside Invite, fourth runner at the Troy Invite, and third runner in every other meet after Troy except Conference when she finished fourth. Katie broke 14 minutes at her second meet of the season, broke 13 minutes at Tiger Trails, and broke 12:30 at Fox Trot to set her P.R. of 12:20 for the season. Her P.R. was the 21st fastest P.R. in team history. Katie also contributed to the team with her infectious enthusiasm for the sport. Whether she realized it or not, her friends noticed how much she enjoyed cross country and ended up joining the team. Even if Katie hadn’t stepped up as an eighth grader and become an important part of our postseason team, her love of the sport will leave an enduring legacy at Yorkville Middle School. Alexis Wasserberg came to Yorkville in seventh grade after running for Herget in sixth grade. She quietly made an impact immediately. She ran a P.R. 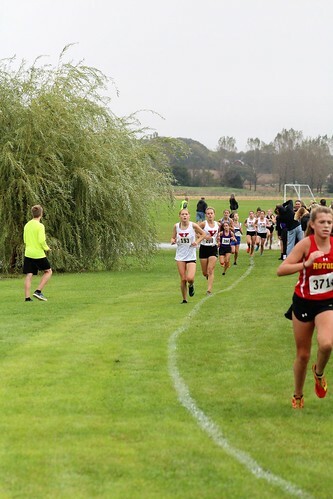 of 12:20 at the Parkside Invite and broke 13 minutes two more times that season, including at State when she was one of three seventh graders to run on a team that finished in fifth place. Alexis has always been one of the quieter runners on our team, but she has absolutely no poker face and you can tell exactly what she is thinking even if she doesn’t say a word. In eighth grade, Alexis struggled early in the season because of her dual commitments to cross country and soccer. Soccer probably has more running than any sport outside of cross country and even when we dropped her mileage, Alexis seemed worn out by the two sports. After talking with Alexis, the coaches decided to drastically limit her mileage at practice. 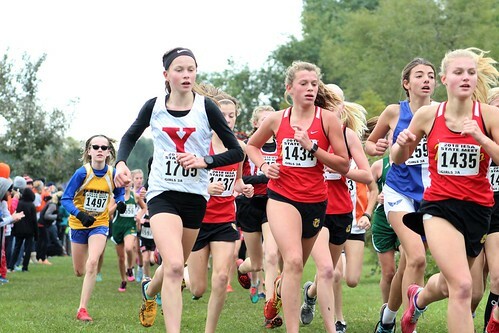 After this decision, Alexis reverted to her seventh grade form and broke 13 minutes for the first time in eighth grade at the Fox Trot Invite. She broke it again at Conference, and was one of only three Yorkville runners to set a P.R. at State. Alexis’ ability to rebound quickly from what could have been a lost season for her bodes well for her ability to handle adversity in the future. Emma Jasutis is one of the only runners in her eighth grade class who attended every cross country practice in both seventh and eighth grade. Her persistence paid off when she made our State team in eighth grade, but it started to show even in seventh grade when she established herself as one of the top seventh grade runners on the team and set a P.R. of 13:21 at the Parkside Invite. Emma broke her seventh grade P.R. 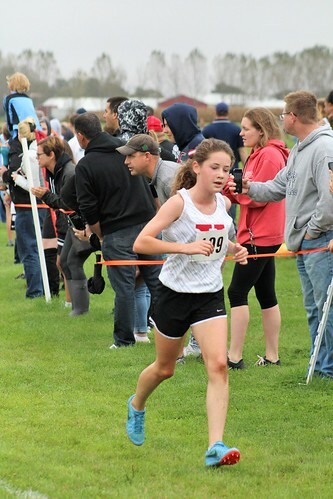 in eighth grade at the Parkside Invite with a time of 12:49, and she broke 13 minutes five more times over the course of the season, including her time of 12:45 at State. Her P.R. of 12:28 at the Fox Trot Invite eclipsed her older sister Becca’s P.R. from 2011 by one second. Becca and Emma are incredibly supportive sisters and with Becca currently running cross country and track in college, Emma has a great role model to look up to. With Emma’s dedication to cross country and track, positive attitude, and work ethic, she will hopefully serve as a great role model for younger runners as well. Erin O’Connor was the only seventh grade runner on our State team, which hasn’t happened since the 2014 girls team that took home a fourth-place trophy at State. Coincidentally, Erin’s older sister Colleen was an eighth grader on that trophy-winning team. On the girls side, it is common to have multiple seventh grade runners on the team, but Erin stood out this year and became the only underclass runner on our State roster. Erin had a great summer running at Endurance Camp and emerged at the beginning of the season as one of the top seventh grade runners on the team. 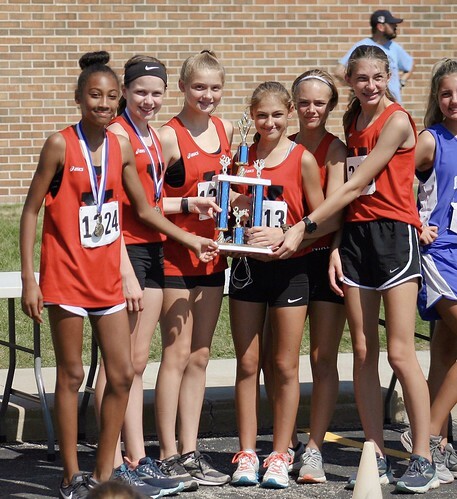 While Erin didn’t see the huge time drops that some other seventh graders saw, that is because she was already well conditioned from the summer and she became one of the most consistent runners on the team. Erin was the top Yorkville finisher in the open race at the Parkside Invite, earned a medal at Troy as our top seventh grade runner in 18th place, finished as our #2 runner at Tiger Trails on a team that finish in first place, and won the J/V race at the Fox Trot Invite. After August, Erin’s slowest time was 13:31. She set her season P.R. of 12:47 at Fox Trot and nearly eclipsed that time with her 12:48 at State. Erin looks poised to help lead the girls to a successful season next year. Tatum Whisenant had an inconsistent year as a seventh grade runner. She was put in Coach Miller’s group after running a time trial under 15 minutes at the beginning of the season, but she struggled to keep up in workouts. After discussing the situation with her, Coach Miller made the difficult decision to move her back to Coach Martin’s group. It is rare for a runner to be moved down a group, but Tatum wasn't going to see success if she wasn't able to keep up with the other runners in her group. Tatum continued to be up and down the rest of the season, but still finished with a solid P.R. of 13:38. Eighth grade saw a much more consistent Tatum. She started the season with a 14:30 at the time trial and after setting a P.R. of 13:04 at the Parkside Invite she stayed below 14 minutes the rest of the season. Tatum was often in the top five on our varsity team. She finished fourth on the team at the Parkside Invite, fifth at the Troy Invite, fifth at the Tiger Trails Invite, fifth at the Fox Trot Invite, and third at Conference. Tatum’s newfound consistently is going to serve her well if she continues running through high school. Josh Pugh almost didn’t join cross country in seventh grade. He tried out for the soccer team and joined cross country after not making soccer. He started the cross country season strong and only ran one race with a time slower than 14 minutes. Josh was constantly the team’s #3 seventh grade runner, but was never the top runner on the team. 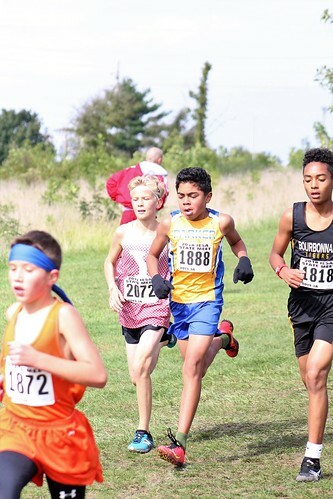 This is rare for someone who would be the team’s top runner in eighth grade, but Josh worked hard over the summer and became a more strategic runner as an eighth grader. As an eighth grader Josh led the team throughout the entire season. He ran an 11:19 at the Parkside Invite to finish in 11th place to start a streak of medals at invites. Josh also earned a medal at the Troy Invite with his 25th-place finish and followed it up with a wire-to-wire victory at the Tiger Trails Invite. At the Fox Trot Invite, Josh broke 11 minutes with his time of 10:52 to finish in fourth place and set the 10th-fastest P.R. in Yorkville history. Josh earned All-Conference honors with a third-place finish and the same week earned All-Sectional honors in third place while running a smart race. 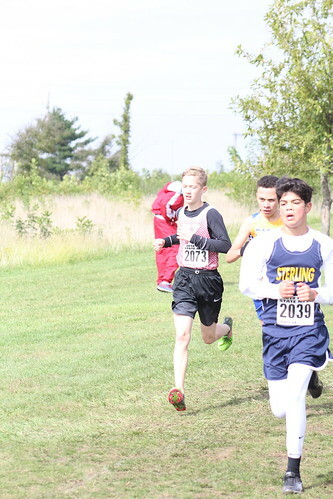 While an illness prevented Josh from earning All-State honors, in eighth grade Josh really figured out how to best use his abilities to be a great runner and that will serve him well in high school. Max Rowe came into the cross country season with a lot of hype. 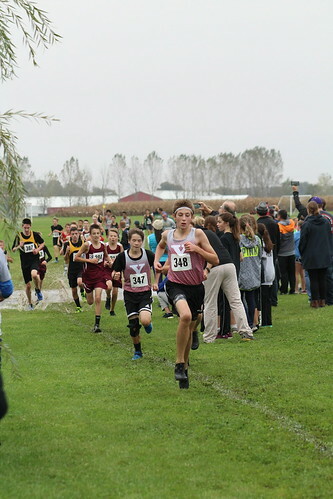 In sixth grade Max finished second overall in the open race of the Fox Trot Invite, beating many seventh and eighth grade runners while running a 12:19. Max would only run slower than that time once as an eighth grader. At the Parkside Invite, Max set our seventh grade boys course meet record with a time of 11:25. Max ran a strong race at the Troy Invite trying to win it. He finished in fifth place, but his time of 11:52 was the second-fastest ever by a seventh grader at Troy. At the Tiger Trails Invite, Max was in one of the most exciting races of the year as he tried to out-duel the Jenkins twins from Herget. He beat one of the twins to finish second and he ran the third-fastest time for a Yorkville seventh grader at Tiger Trails. Max was the only seventh grader to run in the varsity race at Fox Trot, and earned a medal finishing in sixth place with his season P.R. of 11:03, which is the second-fastest P.R. ever for a Yorkville seventh grader and the 15th fastest P.R. for a Yorkville boy of any grade. Max has already proven he has the drive to be a great runner, and he will serve as a grade leader for our team next cross country season. Nolan Wood was the other seventh grader on our State team. 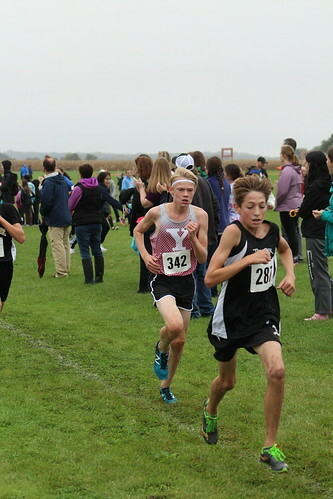 To put it in perspective, the last time there were ANY seventh graders running for the Yorkville boys at State was 2015. Nolan had a busy fall schedule with soccer games as well as cross country meets, and he became the last runner chosen to run for us at State. Nolan started out the season strong, breaking 14 minutes at our first meet at Geneva. 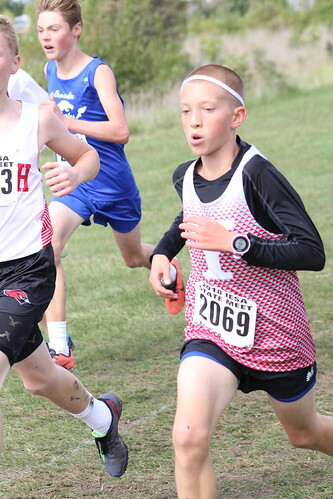 Nolan ran a great time of 12:24 in the open race at the Parkside Invite, but was overshadowed by a faster time from fellow seventh grader Dylan Bourque. Nolan came back with a strong race at Troy and finished in 12:54 as our #2 seventh grade runner behind Max. Nolan had to miss the Tiger Trails Invite because of a soccer tournament so he was temporarily off the radar to make our State roster. 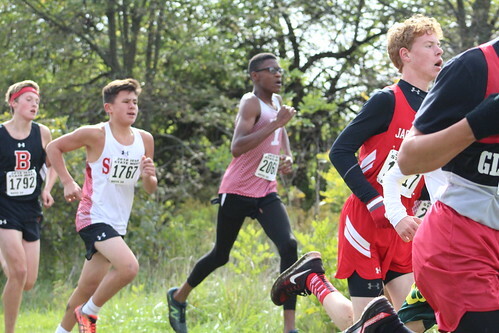 He got himself back on the radar in a big way when he returned for the Fox Trot Invite and nearly won the J/V Boys race with a time of 11:41. At State, Nolan was the only Yorkville boy to run a personal record and he ran perfect splits (the same time for each mile). Nolan works hard, but never takes running so seriously that he prevents it from being fun. His attitude is going to help the boys team next year as they hope to qualify for State for the eighth year in a row. Aaron (A-aron) Wynn ran under the radar in seventh grade. He ran 14:21 at our first meet of the season at Lyon Farm and ended up with a P.R. of 12:50 at Tiger Trails. Typically, our top State runners run under 12:30 in seventh grade, but Aaron bucked that trend this year. Over the summer, Aaron wasn’t running with the top group of boys during Endurance Camp. He wasn’t even with the second group. However, he worked hard all summer and was consistently at the front of his group. He ran a 13:23 at Geneva, but after that he was almost always under 12:30. By the end of the season, Aaron was consistently running under 12 minutes and set a P.R. of 11:40 at the Fox Trot Invite. After spending seventh grade as the the sixth or seventh runner on the team, Aaron spent eighth grade consistently in our top five. He was our #5 runner at the Parkside Invite, our #3 runner at Troy, #5 at Tiger Trails, #5 at Fox Trot, #3 at Conference and Sectionals, and #5 at State with a time of 11:48. Aaron’s consistency and work ethic helped him become one of our surprise runners in eighth grade, and he should serve as a model to current seventh graders for what can happen with a good summer of running at Endurance Camp. Zach Russo was the only 2018 State runner to not start the season in Coach Miller’s group. However, he stood out in seventh grade running sub-13 minutes four times, including his P.R. of 12:02 at Tiger Trails. Zach finished as the team’s #2 runner at the Troy Invite, which really showed his potential. Knee issues plagued his seventh grade season, though, and although Zach ran some fast times in seventh grade he wasn’t consistently performing to his potential. In eighth grade, Zach showed he was dedicated to working around his knee issues. He moved up to Coach Miller’s group after a plan was developed to have Zach run less mileage than the rest of the team and finish his workouts on the stationary bikes. This strategy worked well for Zach as he dropped his time by three minutes in a span of three weeks that had him breaking 12 minutes for the first time at the Parkside Invite. Starting with the Parkside Invite, Zach was our #3 runner for the majority of the season and finished as the second eighth grade boy at the Troy Invite and Tiger Trails. His dedication, willingness to listen to the coaches, and ability to push himself independently on the stationary bikes led to an incredibly successful season for Zach. In seventh grade, Dillan Black never broke 13 minutes. His P.R. of 13:11 was a good time, but much slower than the majority of our 2018 State runners ran in seventh grade. Dillan had an incredibly successful track season, though, and ended up running the 800m and 1600m at Sectionals for the team. Dillan had the team’s fastest 1600m time with the 5:32 he ran at Sectionals. Dillan’s track season provided a great starting point for his successful summer of Endurance Camp going into eighth grade. Dillan started off his eighth grade season strong. He was our #4 runner at the Parkside Invite and was nearly our #3 runner running a 12:01. However, the injury bug bit Dillan and he decided to run through it since to fully heal he would need to take off a few weeks of running and running on the injury wouldn’t make things worse. While the injury held Dillan back a little bit, it didn’t prevent him from nearly running P.R.’s in three straight invites. Dillan ran a P.R. of 11:52 at Tiger Trails, he ran a time of 11:53 at Fox Trot, and ran a P.R. of 11:51 at Conference. Hopefully Dillan found some time to rest after the cross country season and is ready to once again have a fantastic season of track in the spring. Ben Whaley is the biggest success story on our 2018 State team. In Endurance Camp during seventh grade, Ben ran an 8:15 mile and was put in the slowest Endurance Camp group. At the first two-mile time trial during cross country, Ben ran 18:10. While Ben wasn’t in competition to be one of the top seven seventh graders, he ran a P.R. in every meet in seventh grade other than two and finished the season with a P.R. of 14:01. Ben was in the same group as Aaron during eighth grade Endurance Camp, which meant there were two groups of boys behind him. Toward the end of Endurance Camp in eighth grade Ben shyly came up to the coaches at the end of practice and asked what extra running he could be doing to get faster. It’s great to have runners with this initiative and we told him extra running might actually hurt him and he should focus on the other “extra” things like getting enough sleep and a healthy diet while working his hardest during practice. Ben took all of this to heart and had an incredible season. At the Parkside Invite, Ben ran a P.R. of 12:28 and was shocked that he not only broke 13 minutes, but broke 12:30. While Ben was the seventh runner on our varsity team by over 15 seconds, he was starting to gain confidence. Ben was our eighth runner at the Troy Invite, but came back at Tiger Trails to break 12 minutes for the first time as our #6 runner with a time of 11:57. Ben made an even bigger jump at Fox Trot when he set his season P.R. of 11:37 and finished the race as the #4 runner on the team. 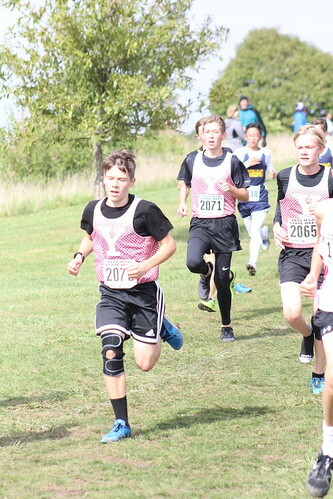 Ben attitude toward running and willingness to do everything it takes to get better earned him Coaches Awards in seventh grade as well as eighth grade. He is the only runner on our State team who won the award both years, and it’s a testament to how hard he works.